As the United National Party’s crisis deepened late last week after the nominations process for the Western and Southern PC polls ended with dissatisfaction all around, Economic Development Minister Basil Rajapaksa has telephoned disgruntled Colombo Mayor A.J.M. Muzammil to ‘congratulate’ him. The Sunday Times in its Cafe Spectator Column notes that Muzammil was perplexed by the Minister’s congratulations since he and his wife Ferouza are smarting over the Party’s decision to deny her a nomination to contest the Western PC poll from the Colombo District. Minister Basil Rajapaksa quipped that he was congratulating the Mayor because if his wife had received nominations, the Government would have to make provision for UNP Colombo District Chief Organiser Ravi Karunanayake who would have crossed over. 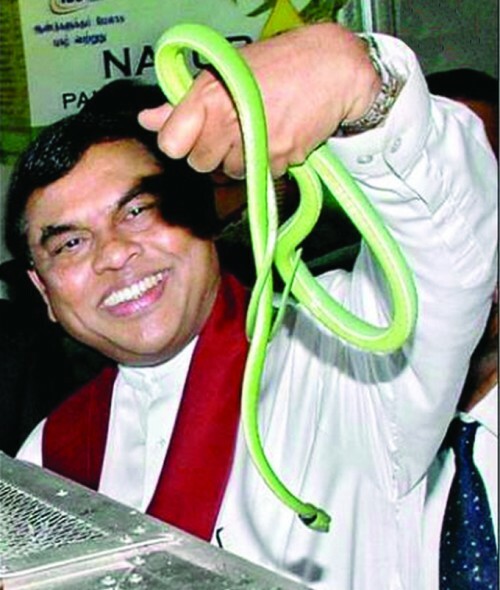 Speculation has been rife that Karunanayake is poised to join the Government if he is not elevated to a position above UNP Hambantota District MP Sajith Premadasa. Karunanayake is also engaged in a long war against the Colombo Mayor. Muzammil meanwhile is in the process of severing ties with UNP Leader Ranil Wickremesinghe and the Party’s Leadership Council Chairman Karu Jayasuriya who he has publicly chastised for failing to give his wife a nomination to contest the poll. Less than 24 hours after the UNP Nomination Board finalised its decision the Colombo Mayor made up old quarrels with Sirasa Media Chairman Kili Rajamahendran, Ceylon Newspapers (Mawbima) proprietor Tiran Alles and MP Sajith Premadasa. With these individuals who are carrying out an open campaign to destroy the UNP because of their antagonism towards Leader Wickremesinghe, the Colombo Mayor is holding long conversations to reveal details of the party’s internal affairs. He has also been seen and heard running down UNP Leader Wickremesinghe and the party and revealing details about how he blasted his Party Leader with Defence Secretary Gotabhaya Rajapaksa at the President’s Independence Day banquet on February 4. Mayor Muzammil has pledged to ensure the UNP loses at the upcoming Western Provincial Council election because of the slight against his wife. Although there was speculation about the Mayor’s crossover, Colombo Telegraph learns that Muzammil will not join the Government immediately, because he would stand to lose his position as First Citizen of Colombo. The UNP still holds a majority in the Colombo Municipal Council and if Muzammil joins the Government ranks within the Council he will be relegated to a mere councillor. “Muzammil likes being mayor too much to give it up in a hurry. It is his fear about losing all relevance once his term ends just over a year that is prompting him to so strongly advocate for his wife. The Muzammils were also hoping to field their daughter for political office in due course,” one UNP MP said, on condition of anonymity. “It was Ferouza Muzammil whose support base in Colombo ensured Mr. Muzammil won the election in 2011. She remains a highly popular figure and a crowd puller. She should have been given a nomination because the UNP needs winners in Colombo. The Mayor on the other hand has become increasingly unpopular in Colombo because of his cozy relationship with the Defence Secretary. He doesn’t act like a UNP mayor who won office but as if he is someone who was appointed to his position by the Rajapaksa Administration. So what other candidates say about Muzammil’s actions eroding the party’s support base in Colombo is very true. But maybe his wife should not have been penalised for it,” the MP said.